Condition is Near Mint. Only one queen. QUEEN - USED CONCERT TICKET STUB - WINTER GARDENS BOURNEMOUTH 1974. THE QUEEN CONCERT TICKET STUB HAS BEEN AUTOGRAPHED ON THE BACK BY BRIAN MAY AND JOHN DEACON. THE QUEEN CONCERT TICKET STUB HAS FOLDS AND CREASES IN IT, IT ALSO HAS A RIP IN IT ON THE FRONT RIGHT HAND SIDE (SEE PHOTOS FOR THIS), ALL FOUR CORNERS HAVE BEEN PRETTY MUCH WORN AWAY! Nice looking ticket from the Queen concert at Knebworth, 9. th August 1986. HISTORIC IMAGE INVALUABLE TAKEN IN 1979. TAKEN BY A. In addition to his work with Queen, he led a solo career, penning hits such as "BARCELONA", "I WAS BORN TO LOVE YOU" and "LIVING ON MY OWN". EXCEPTIONAL VALUABLE & TOTALLY UNIQUE IMAGE & UNRELEASED TO THE GENERAL PUBLIC AT LARGE; A TOTALLY EXCLUSIVE QUEEN. Venue : Queens Theatre, Blackpool. Condition : Very Good. Queen 1970s-1980s concert ticket montage print,A4,copy,framed. TAKEN BY A. In addition to his work with Queen, he led a solo career, penning hits such as "BARCELONA", "I WAS BORN TO LOVE YOU" and "LIVING ON MY OWN". BINGLEY HALL STAFFORD GIG; EXCEPTIONAL- VALUABLE- TOTALLY UNIQUE IMAGE & UNRELEASED TO THE GENERAL PUBLIC AT LARGE; A TOTALLY EXCLUSIVE QUEEN. TAKEN BY A. 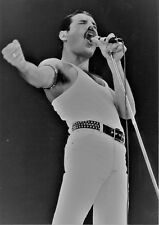 In addition to his work with Queen, he led a solo career, penning hits such as "BARCELONA", "I WAS BORN TO LOVE YOU" and "LIVING ON MY OWN". TAKEN RIGHT UP CLOSE AT THE N. E C. EXCEPTIONAL VALUABLE & TOTALLY UNIQUE IMAGE & UNRELEASED TO THE GENERAL PUBLIC AT LARGE; A TOTALLY EXCLUSIVE QUEEN. I am disposing of my extensive collection of badges and patches, which I built up mostly at concerts in the 1970s and 1980s. across, and is in fairly good overall condition. These badges are reflective, so the scan may appear a little distorted, but the item itself is perfectly clear. Dominion Theatre. WE WILL ROCK YOU The Musical. At Parade Records we pride ourselves on providing high quality vinyl/CDs, and a friendly and professional service. M - Mint– In Perfect / As New Condition. The tour began in Cardiff on 11. th November 1975 and took in dates across the UK, USA, Japan and Australia culminating in a concert at Brisbane Festival Hall, Australia on 22. nd April 1976. The condition is very good plus. Killer Queen Concert Tickets Floor Seats at Nottingham Arena Fri 27th Sept 2019 Block B Row C Seats 21 & 22. Tickets shall be posted by recorded delivery signed for with tracking number when received from promoters which is approx 4 wks b4 the event or buyer may have special delivery guaranteed by 1 nxt day with tracking number at £6.50 which is insured against loss by Royal Mail. If you provide yr mobile number at time of purchase then I can message you when I receive the tickets & provide the tracking information as ebay automatically deletes messages afta a couple of mths. Thanks for looking. 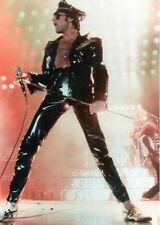 In addition to his work with Queen, he led a solo career, penning hits such as "BARCELONA", "I WAS BORN TO LOVE YOU" and "LIVING ON MY OWN". TAKEN BY A. BINGLEY HALL STAFFORD GIG; EXCEPTIONAL- VALUABLE- TOTALLY UNIQUE IMAGE & UNRELEASED TO THE GENERAL PUBLIC AT LARGE; A TOTALLY EXCLUSIVE QUEEN. Ex = shows very minimum signs of ageing and wear and tear. Complete and intact. Ex = shows little or no sign of any wear and tear. Although it has been opened and used it is complete and intact. Almost new. QOTSA Queens Of The Stone Age Large Shirt Rare Design. Condition is Very Good. Dispatched with Royal Mail 1st Class. QUEEN CONCERT TICKET. 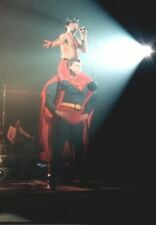 THE LEGENDARY CONCERT. MAY 29, 1977. NEW BINGLEY HALL, UK. FEATURES JOHN DEACON WITH FREDDIE BY HIS SIDE;. TAKEN BY A. 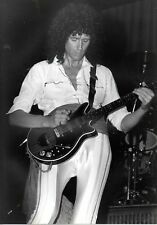 In addition to his work with Queen, he led a solo career, penning hits such as "BARCELONA", "I WAS BORN TO LOVE YOU" and "LIVING ON MY OWN". A Rare & valuable collectors item! This photo UP CLOSE AND PERSONAL UNIQUE SHOT. [5 September 1946 – 24 November 1991] was a British musician, best known as the lead vocalist and a songwriter of the rock bandQUEEN. John Deacon was recruited prior to recording their EPONYMOUS DEBUT ALBUM in 1973. Queen first charted in the UK with their second album, QUEEN 11, in 1974, but it was The release of SHEER HEART ATTACK later that year and A NIGHT AT THE OPERA in 1975 which brought them international success. FREE 1st CLASS NEXT DAY SIGNED FOR, ACTUAL PHOTOS, ULTRA RARE, ONLY ONE ON EBAY ANYWHERE IN THE WORLD, THIS LISTING IS FOR 1 (ONE) GENUINE TICKET ONLY, CHECK MY 586 - 100% POSITIVE FEED BACK, PLEASE ALSO SEE MY OTHER ITEMS FOR SALE, WILL SOON BE LISTING ALL MY OTHER QUEEN TICKETS AND MEMORABILIA, KEEP AN EYE ON MY OTHER ITEMS... THANKS....................STEVE. QUEEN UK TOUR T SHIRT IN VERY GOOD USED CONDITION. TOTALLY HAUNTINGLY LOVELY SHOT. 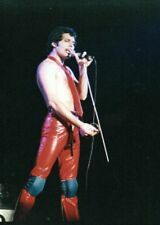 In addition to his work with Queen, he led a solo career, penning hits such as "BARCELONA", "I WAS BORN TO LOVE YOU" and "LIVING ON MY OWN". A LEGEND AND HIGHLY COLLECTIBLE AND priceless incredible 1986 ACTION SHOT;. IT IS IN A VG/VG CONDITION…. THERE IS A LITTLE WEAR AND TEAR TO EACH CORNER…. AND GENERAL AGEING/MARKS AND EDGE WEAR ALL ROUND. THE BACK EASEL IS STILL ATTACHED AND HAS RARELY BEEN USED…. HAVE A GOOD THINK ABOUT IT IF YOU'RE A FAN AND COLLECTOR OF THIS TRULY GREAT BAND…. 9 DISC DVD BOX SET. Grab an amazing bargain at a good price! Don’t miss out! PERFECT GIFT FOR ANY OCCASION FOR A ROCK LOVER. THE ITEM YOU WILL RECEIVE WILL BE SEALED. THE ONE PICTURED IS JUST TO SHOW THE CONTENTS. I am disposing of my extensive collection of badges and patches, which I built up mostly at concerts in the 1970s and 1980s. across, and is in good overall condition. These badges are reflective, so the scan may appear a little distorted, but the item itself is perfectly clear. Rare & valuable collectors item! AN INCREDIBLE UNIQUE TINTED IMAGE SHOT OF THE. John Deacon was recruited prior to recording their EPONYMOUS DEBUT ALBUM in 1973. Queen first charted in the UK with their second album, QUEEN 11, in 1974, but it was the release of SHEER HEART ATTACK later that year and A NIGHT AT THE OPERA in 1975 which brought them international success. Featuring hologram on the left edge. Rare & valuable collector`s item! TOTALLY unreleased to the public at large and. This photo UP CLOSE AND PERSONAL UNIQUE. In addition to his work with Queen, he led a solo career, penning hits such as "BARCELONA", "I WAS BORN TO LOVE YOU" and "LIVING ON MY OWN". QUEEN THE WORKS TOUR WEMBLEY 1984 BILLBOARD UNIQUE IMAGE PHOTO FOR THE SERIOUS QUEEN FAN AND SERIOUS MUSIC COLLECTOR;. OF THE HISTORIC WEMBLEY ARENA BILLBOARD;. HERE YOU HAVE A RARE AND COLLECTIBLE IMAGE PHOTO TAKEN PRIOR TO THE WEMBLEY GIG SEPTEMBER 1984. TAKEN BY A. 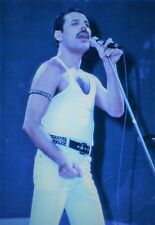 In addition to his work with Queen, he led a solo career, penning hits such as "BARCELONA", "I WAS BORN TO LOVE YOU" and "LIVING ON MY OWN". EXCEPTIONAL VALUABLE & TOTALLY UNIQUE IMAGE & UNRELEASED TO THE GENERAL PUBLIC AT LARGE; A TOTALLY EXCLUSIVE QUEEN. TH JANUARY 1971 AT THE QUEEN ELIZABETH HALL IN LONDON UK BY THE SUPERB ENGLISH FOLK-ROCK BAND 'FOTHERINGAY'. Good = Possible overall quality deterioration. Obvious signs of ageing, wear and tear, folds and creasing.